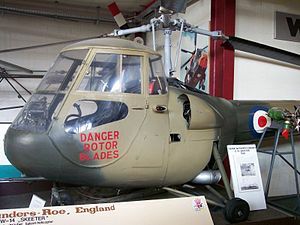 The Saunders-Roe Skeeter was a two-seat training and scout helicopter produced by Saunders-Roe ("Saro") of Cowes and Southampton, in the United Kingdom. The Skeeter has the distinction of being the first helicopter to be used by the British Army Air Corps. In 1947 the Cierva Autogiro Company began work on the Cierva W.14 Skeeter, a small two-seat helicopter suitable for both civil use and as a military observation aircraft. The Skeeter was a single-engined helicopter of conventional configuration, with a 29 foot (8.84 metre) three-bladed main rotor and a three-bladed anti-torque rotor mounted at the end of a triangular section tailboom. The crew of two sat in a glazed cabin, with the engine, a 110 hp Jameson FF-1 air cooled horizontally opposed piston engine, mounted behind the crew and under the main rotor. A fixed tricycle undercarriage was fitted. The first prototype Skeeter, registration G-AJCJ made its maiden flight at Eastleigh airfield on 10 October 1948. The helicopter proved to be underpowered, and the experimental Jameson engine was prone to overheating, so it was decided to develop a Mark 2 Skeeter, to be fitted with the well established de Havilland Gipsy Major 10, giving 145 hp (108 kW). The Skeeter 2 first flew on 15 November 1949, but it soon became apparent that it suffered from severe ground resonance problems that Cierva struggled to resolve, causing it to be destroyed during ground testing on 26 June 1950. Despite these problems, Cierva received an order from the Ministry of Supply for three improved Skeeters, (two Mark 3 and one Mark 4) for evaluation by the Royal Air Force and Royal Navy. These three aircraft were not completed before Saunders-Roe took over the Skeeter programme from Cierva in January 1951. Testing showed that these aircraft remained underpowered and that the ground resonace problems had not been resolved, causing official interest to be suspended with Saunders-Roe undertaking a long series of company funded tested to identify the causes and to identify solutions to the problems. The solution involved a rededigned undercarriage and revised blade friction dampers on the rotor head. This allowed Saunders-Roe to finally demonstrate that the ground resonance problems had been fixed with the Skeeter Mark 5 in March 1954. This re-ignited official interest in the Skeeter, with an order for four Skeeter Mark 6s with 200 hp (149 kW) Gipsy Major 200 engines (designated AOP.10 and T.11 by the British armed forces) for evaluation, and finally production orders for 64 AOP.12s, with a 215 hp (160 kW) engine, were placed from 1956, with deliveries starting in 1958. The British Army ordered 64 Skeeter 6's to be designated as the Skeeter AOP.12 (Air Observation Platform), and the Skeeter finally entered service in October 1956. With the merger of the helicopter activities of the British Bristol Aeroplane Company, Fairey and Saro with Westland Aircraft in 1960, plans to develop a turbine powered version were abandoned. Although this knowledge was used in the development of the Westland Scout and Westland Wasp through the P.531 which was based on the Skeeter airframe. Original design, first flown on 8 October 1948, powered by a Jameson 106 hp FF-1 engine. It had a triangular cross section to its tail boom. Only one was built. First flew in 1949. Powered by 145 hp Gipsy engine. Suffered badly from ground resonance and eventually shook itself apart. This version had a circular-section tail boom, as did all future versions. Only one was built. Started to show some progress, powered by 180 hp Blackburn Cirrus Bombardier engines. Two were produced. No orders were placed by the British Army. Version for the Royal Navy, was rejected. Similar to Skeeter 2 and 3. Only one was produced. Similar to other earlier Skeeters. Only one was produced. Only three prototypes were procured. Had Gipsy 215 hp engine. This was the most successful Skeeter. 64 were built and acquired by the British Army Air Corps. Air Observation Platform helicopter for the British Army Air Corps. Training version for the RAF. The Skeeter T.13s were used to train army helicopter instructors. Commercial version similar to Skeeter 7, with Gipsy Major 215 hp. Only single example completed, with two more abandoned incomplete. German Army Aviation Corps designation for the Skeeter 7. Six were ordered and exported. German Navy designation for the Skeeter 7. Four were ordered and exported. There is one remaining flying example of the Skeeter though a number are held by British museums. "Cierva Skeeter Flies". Flight, 21 October 1948, pp. 477-478. London, Peter. "Last of the Line: The Saro Skeeter". Air Enthusiast, No. 54, Summer 1994. ISSN 0143-5450. pp. 2-5. London, Peter. Saunders and Saro Aircraft since 1917. London: Putnam, 1988. ISBN 0 85177 814 3. "Saunders-Roe Skeeter: Development and Construction of the Mark Six". Flight, 30 March 1956. pp. 355-359, 374.